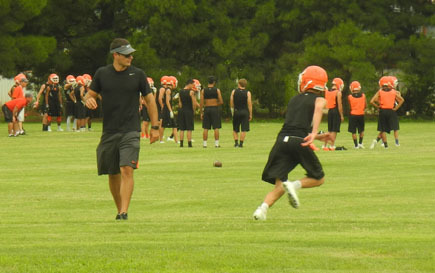 Members of the 2017 Bulldog football team practice their blocking skills Tuesday morning during a two-a-days session at the Bulldog Bowl practice field. The ‘Dogs returned to the grind yesterday under the watchful eyes of second-year head coach Rex Henderson and his staff. The first practice in pads will begin at 9 a.m. Monday, Aug. 7. Team photo day will be held at 5 p.m. Thursday, Aug. 3, at Bulldog Bowl, and a parents’ meeting is scheduled for 6 p.m. Monday, Aug. 7, at the field house. 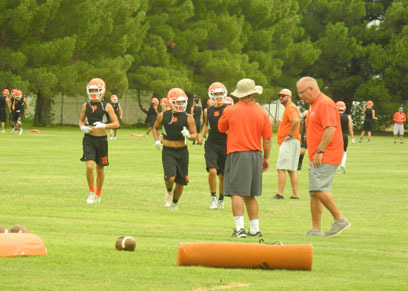 The intrasquad scrimmage will begin at 5 p.m. Thursday, Aug. 10, at the Bowl, and the annual hamburger fry and intermural scrimmage against Las Cruces Onate will begin at 5 p.m. Thursday, Aug. 17. 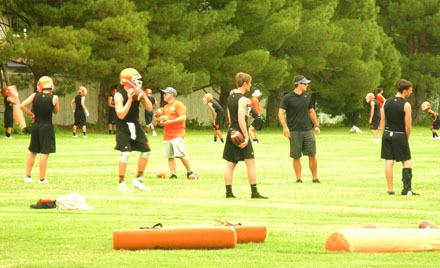 The sophomores will precede that with a scrimmage against Coach Adrian Olivas’ Hagerman Bobcats at 3 p.m.